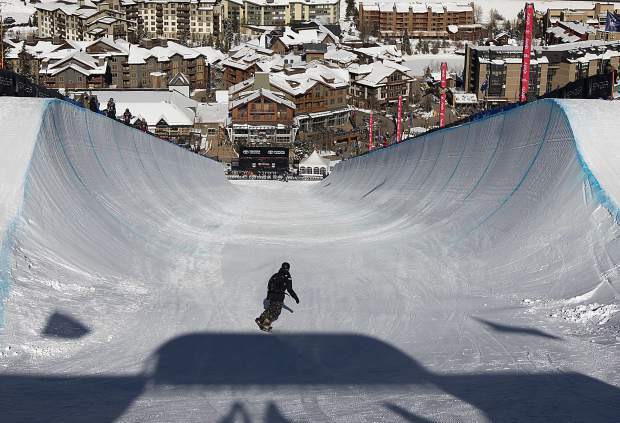 A snowboarder enters the halfpipe during training for the Toyota U.S. Grand Prix World Cup event on Tuesday, Dec. 4, at Copper Mountain Resort. Snowboard qualification rounds will take place on Thursday, with the finals scheduled for Saturday. Heat 1 11:35 a.m. to 12:35 p.m. SUMMIT COUNTY — At Copper Mountain Resort this week, the world’s best halfpipe freeski and snowboard stars will drop in to commence the 2018-19 International Ski & Snowboard Federation World Cup halfpipe season. Wednesday’s and Thursday’s qualifying rounds will see a confluence of 143 of the world’s top men’s and women’s freeski and snowboard athletes, including household Olympic champion names such as Chloe Kim and David Wise, up-and-coming teens such as Chase Blackwell and Jaxin Hoerter and international sensations like Australia’s Scotty James and Switzerland’s Iouri “I-Pod” Podladtchikov. It’ll be the 2014 Sochi halfpipe gold medalist Podladtchikov’s first World Cup event since his nasty spill on the X Games Aspen halfpipe last January, which forced him out of the ensuing month’s Olympics. After shocking the snowboarding scene with his surprise Dew Tour superpipe championship last December — which propelled him to Pyeongchang Olympic qualification — local high country snowboarder Jake Pates figures to challenge James, I-Pod and Japanese star Raibu Katayama at the top of the men’s halfpipe leaderboard during Thursday’s qualifying round and Saturday’s final round. Wise is the headline name for the U.S. squad heading into Wednesday’s freeski qualifiers (8:30 a.m. to 3:30 p.m.) at Copper. Reno, Nevada-based, two-time Olympic halfpipe gold medalist Wise, though, figures to be challenged by Pyeongchang halfpipe silver medalist Alex Ferreira of Aspen and 2017 International Ski Federation World Champion Aaron Blunck of Crested Butte. On the women’s freeski side, the Olympic medalists who will compete for the Grand Prix championship include an American contingent led by Brita Sigourney of Carmel, California; Maddie Bowman of South Lake Tahoe, California; and Devin Logan of West Dover, Vermont. American skier Annalisa Drew of Andover, Massachusetts, also is expected to attempt one of the more technical runs in the 27-skier women’s halfpipe freeskiing competition. The final round of the freeski competition is scheduled for Friday from 11 a.m. to 12:40 p.m. Taking the victory on home snow will be tough for the Americans, however, as the reigning women’s halfpipe Olympic champion from Pyeongchang, Canada’s Cassie Sharpe, is scheduled to compete. In women’s snowboard, a victory for Kim would mean three in a row at Copper Mountain’s annual Grand Prix event, which is now in its 10th year. Kim will be joined by her American teammate Maddie Mastro of Wrightwood, California, in debuting new tricks they’ve worked on this offseason to the competition scene. Both Kim and Mastro arrive at Copper Mountain as the only two women to have landed frontside double corks — two inversions on their vertical axis — on snow. Steamboat Springs native and Breckenridge resident Arielle Gold also should score near the top of the 27-rider women’s snowboard field. It’ll be Gold’s first major competition back, however, from offseason shoulder surgery in the wake of her bronze medal performance on the halfpipe in Pyeongchang. The qualifying round for the snowboard competition is scheduled for Thursday from 8:30 a.m to 3:30 p.m, while the final round is scheduled for Saturday from 11 a.m. to 12:45 p.m.